 Multi-purpose hair catcher allows for a variety of uses. Great when trimming hair, chest, back or beard. Just one of the unique features that separate us from our competition.  Water-resistant nylon allows hair to slide right off, has handy adjustable velcro straps so you can quickly and easily put it on and take it off.  Strong adhesion suction cups that are attached to the cape. Unlike others, our suction cups have an innovative design that allows you to you to lock them securely in place.  One size fits all (47′ x 27′) with tie straps and hanging loops others don’t offer, designed with ease of use in mind.  Built-in self-storage pouch allows you a way to store your bib apron or take it along with you wherever you go. Or use the pouch to hold your grooming tools.  Your grooming no longer needs to result in a choice between a time-consuming cleanup or a hairy disaster. Our quality beard cape is easy to use, easy to clean, and easy to store. It’s quality at a fair price.  NEW FOR 2019: No more mess, now you can control your inner Sasquatch and have effortless clean up after trimming your Beard Chest or Back thanks to our beard shaving bib. Just trim and drop the hair in a wastebasket.  VERSATILE BEARD CAPE BIB has the ability to be used for multiple purposes our competitors don’t offer. Our mens shaving apron is not limited to just your beard. We added tie straps that allow you to trim your chest or reverse the apron and shave your back. 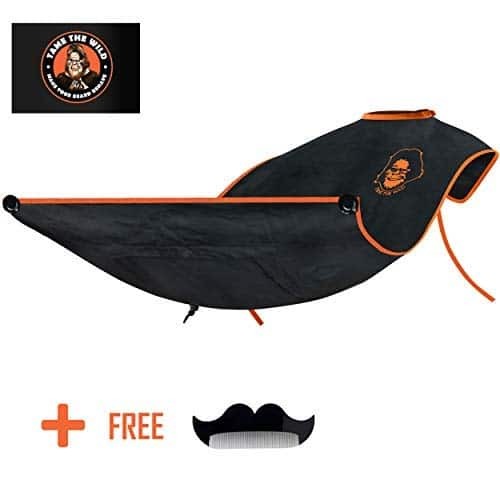  QUALITY BEARD HAIR CATCHER features water resistant nylon that allows hair to slide right off. It has especially designed suction cups that are attached to the apron for your convenience. The suction cups lock into place with an incredibly strong grip, and have pull-tabs for easy release.  100% MONEY BACK GUARANTEE If our beard trimmer catcher for Men doesn’t meet your expectations, simply return it. You have nothing to lose, but an easy clean up and great looking beard to gain.  NO MATTER WHAT YOU ARE SHAVING , chest, face, or back. Our beard trimming apron will speed up the process in a neat and orderly way. It’s lightweight and durable and comes with a handy sewn in storage pouch. As a Bonus we added a free Comb just to say thanks for trying our latest product. As a small family business we value our costumers. We hope you become one today. Facial hair is a problem for women of all ages and removing it hurts… until now! The Vitchelo Portable Mini Electric Shaver for Women is designed to be discreet. Looking at first sight like a fancy lipstick, inside is the finest hair removal technology that removes hair instantly and painlessly with microscopic precision. Within a few minutes, you will get all your face done, and it’s gentle on all skin types and tones. This facial razor for women is BATTERY OPERATED and comes with a PANASONIC battery included free of charge. Perfect for ‘lady mustache & goatee’, this personal groomer for women is great when you don’t want to pluck and will give you the smoothness of waxing and remove every single hair from your upper lip, chick or chin without pain or redness. No nicks, burn or irritation. Just perfectly smooth and finishing touch flawless skin. This womans electric shaver is perfect for quick touch-ups. You’ll be always prepared when hair pops-up out of nowhere, and we’re confident this little small tool will be like this other lipstick you don’t wanna be without when going outside or on travel. Get your electronic womens safety razor Today! Click the Add to Cart Button NOW and say goodbye to unwanted hair, peach fuzz, and achieve a fresh, hair-free look whenever and wherever. 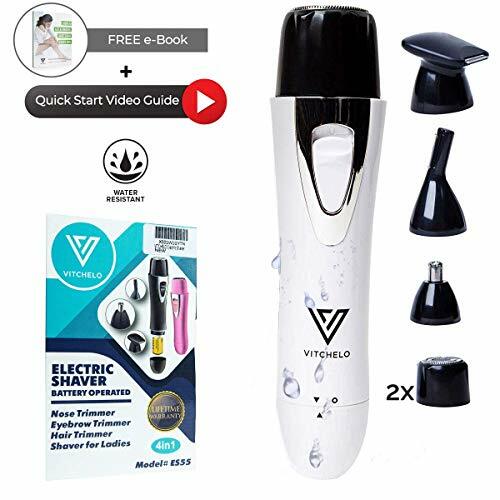 While other shavers for women are a waste of money, too weak, tear up the skin, stop working after a few uses, the VITCHELO 4 in 1 great little personal trimmer hair remover for women and teens girls PAINLESSLY TRIMS UNWANTED nose, eyebrow, face, chin, armpit, leg, body, bikini area, and pubic hair, without nicks, cuts, bumps or irritation. EASY TO USE & CLEAN, will LEAVE YOUR SKIN FEELING LOVELY and SOFT. Get the SMOOTHNESS OF WAXING WITHOUT BURN OR REDNESS. Your facial hair remover tool for women CAN BE USED ANYWHERE ANYTIME which is a huge plus. REMOVE THAT PEACH FUZZ WITH PRECISION and watch your finishing touch makeup go on flawlessly. Works Great. HIGHLY RECOMMEND. Absolutely AMAZING FOR THE PRICE! NO SOAP OR WATER NEEDED – Shave and trim on dry skin or use your painless hair removal for women luxuriously in the bath with your favorite gel or foam. Either way, you’ll enjoy a CLEANER, CLOSER, MORE COMFORTABLE SHAVING EXPERIENCE for your face, underarms and other sensitive areas of your body with this “depiladora electrica para mujer”. MADE WITH PURPOSE, MADE BY US – womens face shaver, ear and nose hair remover, eyebrow shaver, bikini hair removal, leg shavers for women… The VITCHELO ladies electric shaver 4-in-1 set includes everything you need. Purchase your women facial hair remover now, you’ll also take home an ADDITIONAL REPLACEMENT SHAVER HEAD plus a FREE EBOOK tilted “How to get a smooth, safe shave every time” as bonuses. TRY IT FOR 60 DAYS – This lady shaver comes covered by our LIFETIME limited WARRANTY and 60-DAY MONEY-BACK GUARANTEE. Unlike other womens shavers, our face hair removal for women user manual is WRITTEN IN PROPER ENGLISH, also comes with a Quick Start VIDEO TUTORIAL to help you get the best out of your facial epilator and put you in control of the most hard-to-manage parts of your body. NEW ARRIVAL WITH NEW PACKAGE! Are you bored with the pain caused by manual plucking? Have you wanted to try an easy and painless way to get rid of unwanted hairs as well as maintain beautiful eyebrows? The Lovatic Eyebrow Remover is your best choice. The Lovatic Eyebrow Remover is a perfect gift for everyone who prefers the flawless brows. – Instantly and painlessly sweeps away unwanted hair. – Easy to use for all ages and convenient to carry to anywhere. – Eyebrows removal tip with high micro precision. Note: To get the most perfectly result, Lovatic Brows Remover should be used on clean and dry skin which is free of makeup or cream. Step 1: Remove the cap of the LOVATIC Flawless Eyebrow Remover. Step 2: Press the button into the ON position, the light will automatically turn on. Step 3: Move the product in small and circular motions to remove those unwanted hairs. 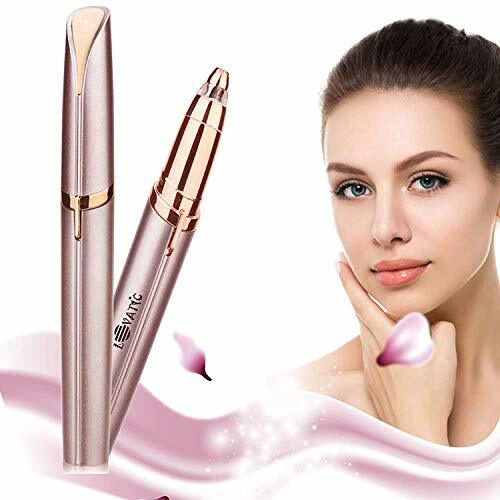 PRECISION EYEBROW HAIR REMOVER: With precision hair removal tip, unwanted and stray eyebrow hairs on the top, at the bottom of eyebrows as well as in between eyebrows are easily erased in the most perfect way. NO PAIN: This Remover is a perfect substitute for other traditional waxes and tweezers. With ergonomic design and liner fine gear, the razor can easily remove rugged areas of skin even at hiding places. No more pain from waxing or plucking. SAFETY & SECURITY: The Razor is designed with aluminum alloy material which ensures both the sharpness and safety when being used. The pencil shape design is easy to handle and make users feel comfortable during experience time. PORTABLE & LIGHTWEIGHT: This Lovatic Hair Remover is designed with portable size and a protected cap. Therefore, it is simple to carry and easy to handle anytime and anywhere. Bring it with you to anywhere you want. TIPS TO USE: Move tightly the unit in small circular motions like eraser, hold the unit like a pencil about 45-60 degree angle. It would be better to move the unit in the opposite direction of hair growth, you may have to go over the same area several times to achieve the result you are looking for. 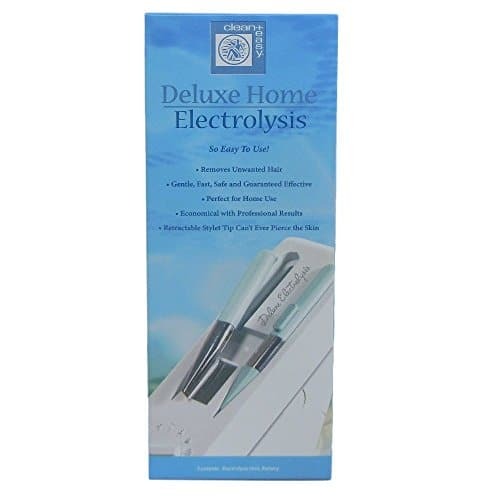 Deluxe Home Electrolysis clean+easy® Deluxe Home Electrolysis is an economical system that provides professional results at home. This system can be used on the face and body. Perfect for gentle, fast and safe removal of unwanted hair. Battery operated – convenient and portable. 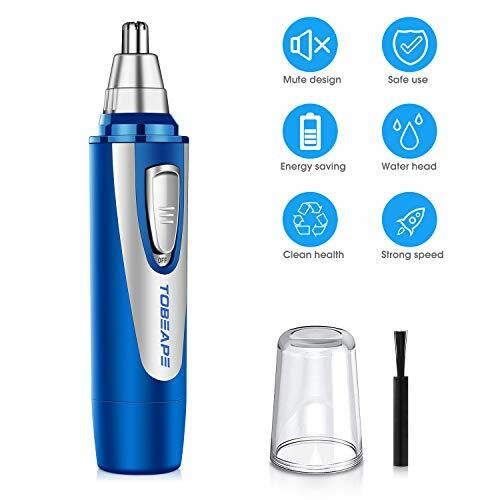 [All In One Blade Trimmer For All Your Grooming Needs]-This professional hair clipper includes beard, hairs, ear, nose, eyebrow precision trimmer and a body groomer a mustaches shaver, achieving the style you desire and effectively trim off unwanted hairs. To trim, shave, detail, and touch-up, from head to toe！The Hair mustaches groomer is an ideal Christmas Thanksgiving Festival gift for bad, husband, boyfriend, colleagues. [Accurate and Skin Friendly for Any Style]-15 pieces of haircut kit accessories make sure a perfect haircut experience. 4 full size trimmer combs (3/6/9/12mm) plus 1 precision trimmer comb (1/2/3/4mm) provide high performance precision to achieve proper height and any hair style. Self-sharpening stainless steel blades with Anti-scratch design for smooth cut ensure safety use and easy to clean. [Powerful and Long-lasting Life]-The hair clippers equip most powerful and durable motor which with high rotational speed for long lasting use. Also, the trimmer has environmental low noise function under 70db. It just need 2 hours’ fast charging time that the Lithium-ion battery can be fully charged for over 100 mins using time. Suitable for a barber shop and meet home hair cutting needs for men, women, kids, seniors. [Simple Design & Cordless Portable Rechargeable]-One-button start or close. The haircut machine has fluent appearance and ergonomic handle easy to carry and store. The smart LED light glow red while charging and turn green full charged. A rechargeable and wide area use plug is included you. This lightweight electric shaver is a perfect tourist accessory for your personal beauty! [100% SATISFACTION GUARANTEED]- We are so confident that you’ll love this groomers helper set that we offer the BEST guarantee on the market. 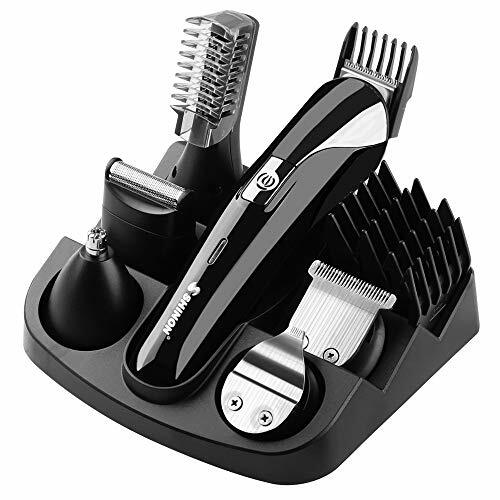 If you aren’t happy with your clipper grooming kit for ANY reason, please contact us. 【7000 RPM MUTE MOTOR】 With 7000 RPM and the noise is below 50 DB motor, you can use our nose hair trimmer confidently while your families are sleeping. Keep better work-family balance. 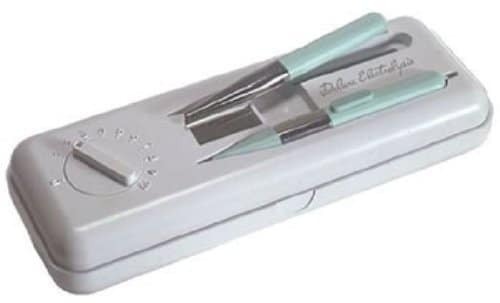 【SAFE TO USE & NO SKIN IRRITATION】 Dual-edge sharp blade and the advanced trimming system supposedly avoids clamping nose hair and hurting nasal cavity. It is painless, smooth, gentle and will not result in painful pulling. 【IPX7 WATERPROOF & EASY CLEANING】 With water resistant technology, it is easily and comfortably for you to trim in the shower or trims dry anytime, anywhere. The included brush makes cleaning process even easier! 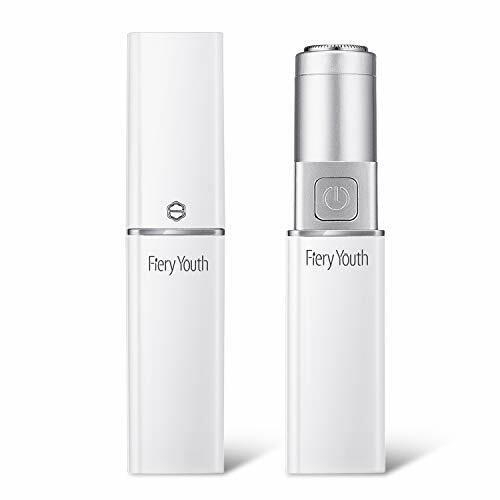 【BATTERY-OPERATED & PORTABLE】 1 AA battery(not included) can operate for more than 6 months if 5 min at a time, which makes it an economically affordable way to take care of the daily trimming needs of your nose, brows, and ears. 5.31 X 0.98inch travel-size is great for carrying around or taking outside. 【100% SATISFACTION GUARANTEED】We stand behind our products and will do what is necessary to ensure your satisfaction. Please feel free to email us and we will reply within 24 hours. It’s absolutely a good choice as a gift for your family and friends. Easy and safe to use – The enclosed razor head design, to avoid blade exposing, easy and safe to change the blades. Which blades use with the razor – Uses a universal, inexpensive double edge blades. Short textured handle – The textured handle does make it easier to hold and help prevent applying too much pressure. 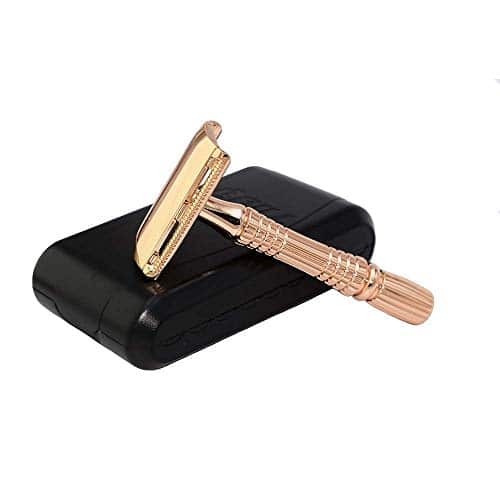 Low cost – Once you have the safety razor, all you need to buy are the blades ,with very low cost blade replacement ,you simply can’t get any better value for money in the long run. Eco-fridendly – With the safety razors all you need to do is replace and recycle the blade, to diminish impact on the environment which helps create a cleaner planet. Unisex – This is unisex item and also safe for feminine. Also fits for arms and legs and did not once feel the usual tug and pull like you get from a conventional 3 or 5 blade razor. 1. Be careful if this is the first time using this type of razor though! Pls go slowly. 2. Once finished with the razor,pls take it all apart, wash the pieces individually and place the razor in an upright position to allow it to dry. 1. Unscrew the head from the handle. 2. It will split into two parts, the comb and the fastener. 3. The fastener has a threaded part to it that fits through the middle of a double sided blade. 4. You then push the comb against it, which secures the blade, and the entire head is then screwed back into the handle. Does your girlfriend get mad when you leave a hairy mess in the bathroom or are you sick and tired of having to unclog those congested drains following a shave? Well, you (and your girlfriend/wife) are in luck. 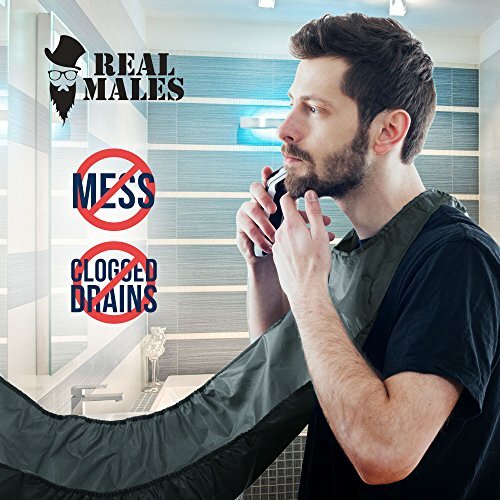 The Beard Catcher Apron by RealMales has been designed to give men an easy and mess-free way to groom their beards, mustaches, sideburns and goatees. The grooming bib is made out of a durable nylon material in Europe, and in order to deliver an all-in-one shaving kit, each order includes a set suction cups that securely lock into place on your mirror as well as a space-saving travel pouch. Never again worry about making your girlfriend angry or having to unclog your sink after shaving thanks to our new beard catcher apron! It comes with suction cups that lock into place, making them ideal beard catchers for shaving mirrors. raditional hair removal methods have great harm to the human body. Wax and paper hair removal can severely irritate the skin and have a full sense of pain. Hair removal creams have large skin irritation and are prone to skin allergies. Our epilator is safe and painless, easy and quick to remove hair and painless without irritation to the skin. Curved design: ergonomic arc design, more convenient to use. Keep away from children and prevent children from being accidentally injured! 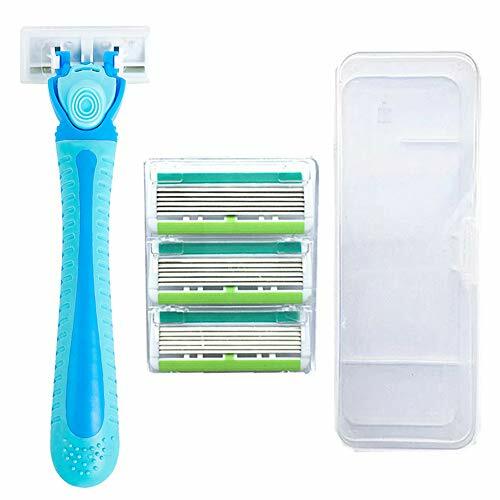 [SIX-LAYER BLADE]:Wrap your skin in comfort with Comfortglide Spa Breeze Women’s razor blade refills with six curve-hugging blades for a smooth shave，Make your body hair shave more easily and cleanly.It will not make you unbearable like hair removal from traditional waxed paper. [PORTABLE]: The body hair remover is stored in a plastic case for easy carrying even when you go out or travel. [PROTECTIVE COVER]: There is a protective cover on each blade, which is dustproof and hygienic to prevent accidental injury to the human body. The Lady Shaver head uses ultra-sharp, extra-durableblades and a protective foil cover specifically designed to protect sensitiveskin for irritation-free shaving. The large surface area make this an ideal legshaver. Gently conformto each of your body’s individual contours for the ultimate in smoother,cleaner hair removal, and more desirable results. With the high-powered blades that grasps yourhair follicles all the way down to the roots leaving your skin hair free andfierce. Banishing the hairs from your arms, legs, and bikini line. The 3 in 1Epilator helps to enhance and unveil your natural skin complexion withouthaving to spend enormous amounts of money on beauty products and spa hairremoval treatments. 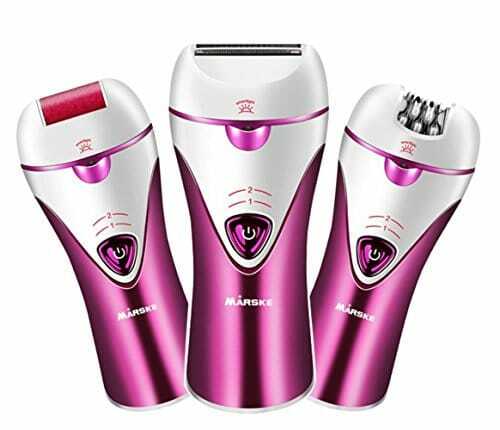 【BUY 1 GET 3】Three interchangeable heads – lady shaver and women electric epilator and callus remover! Save a lot of money from buying separate solutions to your hair and foot personal care accessories. 【HAIR EPILATOR】Efficient Shaving with best epilator. Wide and gentle two epilator heads for smooth short and soft hair removal, even the shortest, finest hair on the underarms, bikini line and hard-to-reach areas, such knees and ankles. 【ELECTRIC EPILATOR】 Rechargeable and cordless epilator for women. Always use the device at optimal power. An anti-slip grip for easy hold. User tip: Hold the epilator handle at a 90 degree angle and against the direction of hair growth for the most efficient hair removal. 【EASY TO USE AND CLEAN】 Waterproof design, you can turn off the ladies epilators hair remover and wash the head with water. Cordless operation, prevent the dust going into the shaving machine. Allows you conveniently use it anywhere. With the tiny shape as a lipstick, this hair removal is designed for women to deeply remove soft lanugo hair, especially the facial hair. Say goodbye to naught hair with a simple and delicate female remover. -Especially designed to use on upper and lower lip, cheeks, chin and neck. Works on peach puzz or fine hair. Go slow with circular movements and it will do the job. -Our hair remover is an electric razor which does not pull hair from the root but gets so close to skin without irritating. -Safe on all skin types and tones, facial hair removal for women, no more cuts from razors, no more redness and irritation. For the first-time usage, do a test within a small area of your hand. If you are allergic, please stop using it. 1 .Pull the “”Upper cap”” open. 2 .Press the “”On/off switch”” to turn it on. 3. Gently press the “”Hair removal head”” an angle against the hair growth direction to rub your face tenderly. 4. Clean the head of the hair removal every time after use. 5. Place the “”Upper cap”” back. Painless & Safe: Our hair removal is an electric razor which does not pull hair from the root but gets so close to skin without irritating hair follicle. With three-dimensional removal head design, it fits body curves elastically without pulling hair, reducing skin irritation, perfect for comfortable shaving. Fashion & Portable: Especially designed for all kinds of temporary occasions, similar appearance and size like a lipstick. The compact and lightweight painless hair remover can be conveniently carried by keeping it in your bags. Grab & Go: Powered by 1*AA battery(INCLUDED), the hair remover easily fits in your handbag and goes wherever you go. No more hassle about cords or charging plug. Put in a battery and turn it on, say goodbye to naught hair immediately. Simplifying Your Hair Removal: The Facial Hair Removal(for women) can work in humid conditions, which makes your hair removal tasks simpler than ever. With scientifically designed removable removal head, cleaning won’t be a problem. 30-day Warranty: We promise our customers a 30-day warranty and 100% satisfaction guarantee. If you have any questions concerning our products, please contact us in 30 days by offering your Amazon order No. or via Email, we are always here to offer help.